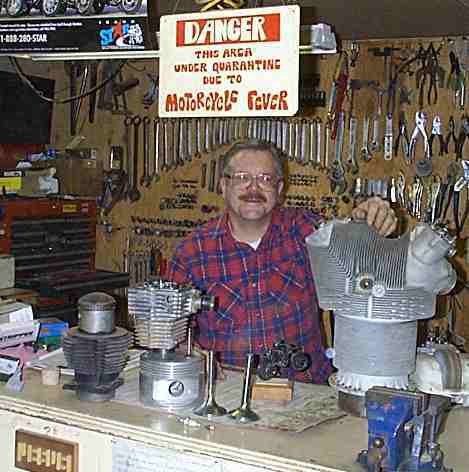 Learn to Fix, Repair, and Overhaul Your Motorcycle Here. If you are interested, for what it is worth, here is my disclaimer for the whole site. If you need a break from twisting wrenches and are really desperate for something to read here is my Blob. ¶ Hello my name is Dan. I have been a motorcycle mechanic since 1967 and now in 2014 I am in the process of retiring 2019 I am Retired. Call me semiretired Retired! I run ran a one man motorcycle shop in the wilds of north Idaho, near Cataldo. In summer I work Goof Off on motorcycles. In winter I do did Taxidermy. Now my Daughter has taken over the Taxidermy Shop. I built this site to help all motorcyclists world-wide, aiming it toward the do-it-yourself Motorcyclist. The most important information on this site is HERE! Working on any engine is always dangerous therefore..."ANY RISK REAL OR IMPLIED FROM USING THIS INFORMATION IS STRICTLY THE RESPONSIBILITY OF THE USER." Over the years I have learned a few things about engine repair that can be applied to almost any engine. Most of this stuff I learned in the school of hard knocks, that is, I broke things... sometimes expensive things, and guess who had to pay for those things! So click on the "Start Button" below, read on and enjoy.... and maybe save a little money! This will change the entire site to your language. Motorcyclists have been helped here! You know, that's not very many people compared to the million hits a day sites. But then, that's OK. I'm not trying to help a million people. I'm only trying to help you!